Welcome back! 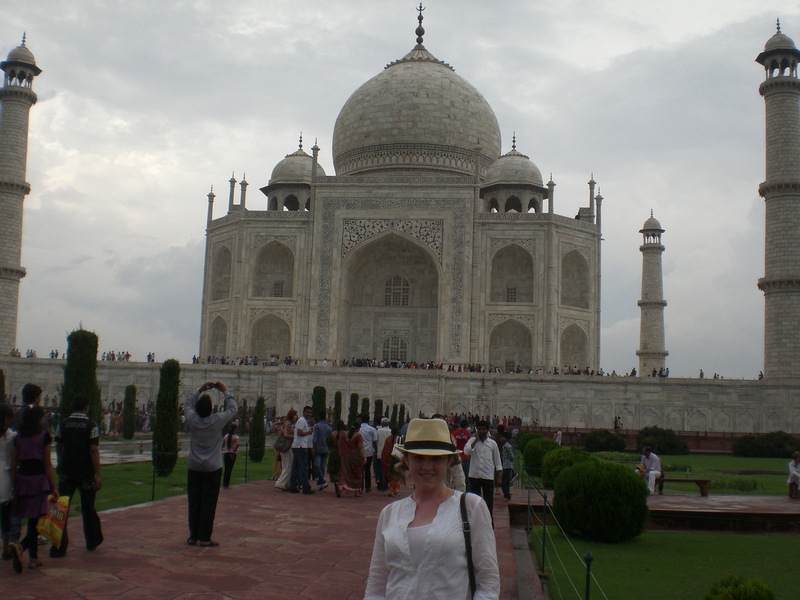 As promised, the story of India and the Taj Mahal continues. Stay tuned for next month when the third and final (maybe!) 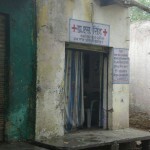 installment of India takes place. 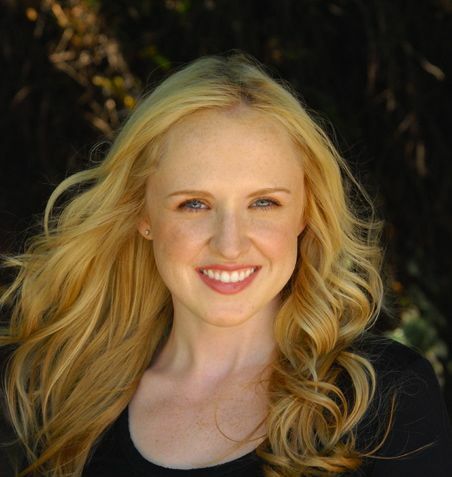 We have just launched “Ask Stephanie!” so bring me your questions, curiosities, and inquiries and I’ll do my best to answer them. The site can’t exist without you, so write! I stand along the side of the road in rural India asking in vain, “How did I get myself into this predicament?” It’s late morning; I’ve already been awake since dawn. 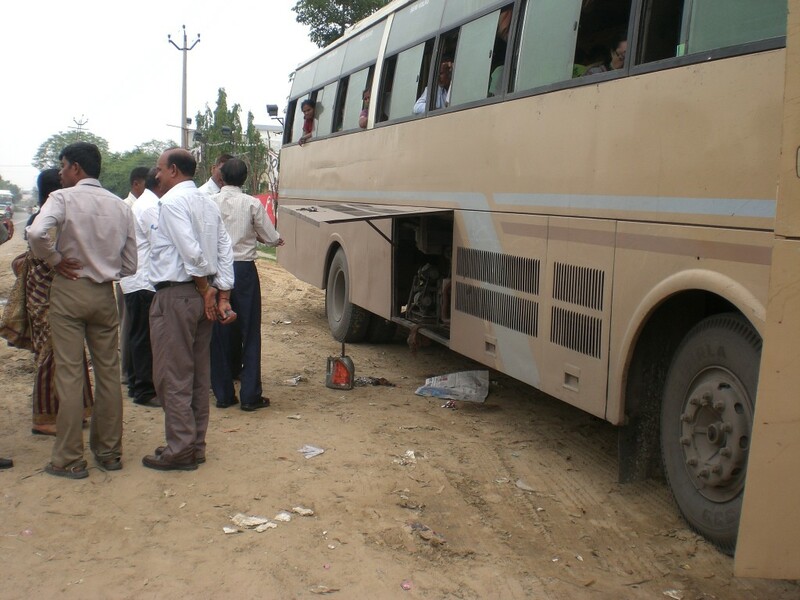 The bus that is supposed to transport Chloë and me on the four-hour journey from Delhi to Agra has, for the third time, broken down. We are stranded; I am bored and find myself hoping for excitement. A little voice that would soon haunt me teases – Careful what you wish for. 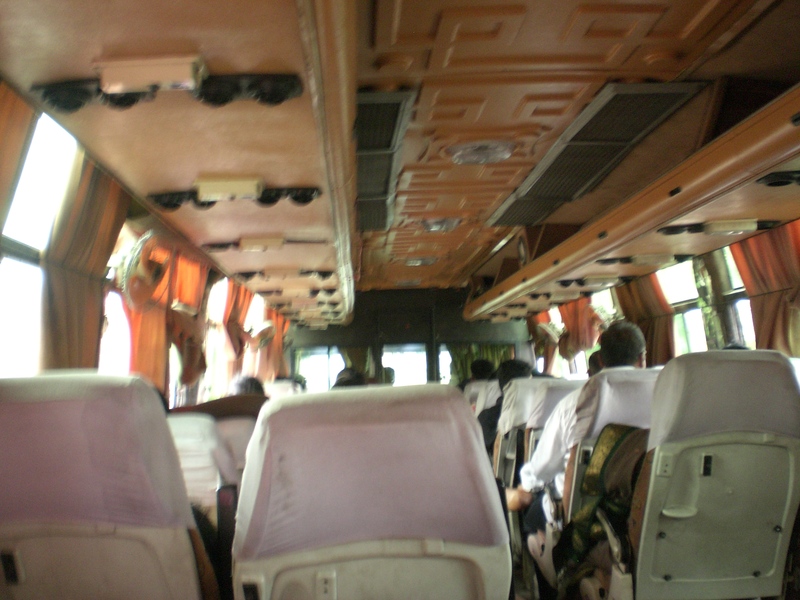 Our air-conditioned chariot…except the A/C wasn’t working. I swat and swoosh away flies while a group of men, both passengers and the driver, examine the engine. Someone has to get oil. We wait. Children run around and the women sit silently, sipping cups of water from a very questionable fountain. About an hour passes, and we finally hear some shouting that’s mostly indistinguishable but still implies that we’re leaving. The bus that could have driven right off the screen of Fear and Loathing in Las Vegas is once again rumbling and emitting toxic fumes into the air. Fingers crossed for a fast final ride, I settle back into the rear of the bus with Chloë. There’s more space here; for whatever reason, the row of seats directly in front of us were ejected at some point. An Indian family, whose maternal figure and children are barefoot, sits on the floor while the man with them, wearing shoes, sits on the seat. As she pulls from her bag some naan bread, curry chicken, and paper plates in a picnic spread for the children, I doze off from the bouncy rocking that comes with the back of the bus. It is with sheer terror that I am jolted awake and catapulted out of my seat, into the air, onto the backs of the seats five feet in front of me. The sound and smell of brakes squeal and claw at the momentum of our speeding bus. Chloë flew up too, and I turn to see the family from the floor rolling up the aisle as the bus lurches to a screeching stop. Still weighing against the seats in front of me, I look up out the front window, half expecting to see a herd of sacred cows in the road. Instead, my jaw drops at the close call. A wave of relief rushes over me as I see a full semi truck stalled on the road in front of us, with FUEL TANK stamped on all sides. Having mere inches to spare, we just avoided plowing head on into it. On a road lined with ditches and oncoming traffic, I shudder to think what could have happened. I was worried about malaria. Dying in a massive explosion hadn’t occurred to me. As awake as I have ever been, I see when we arrive into Agra, and we are instantly greeted with the hustling drivers offering rickshaw rides to town. Chloë, with her trusted Lonely Planet guidebook, directs a driver to the Shanti Lodge Hotel – known not for their accommodations but instead for their rooftop restaurant that unveils a pinch-me-I’m-dreaming view of the Taj Mahal. There is no photo that can capture the awesomeness of seeing this. We faced these storms the better part of our trip. Let the adventures begin! We make our way through the hotel eschewing the dark and dreary air-conditioned room (a somewhat pointless amenity given the frequent power outages), and the second floor that reeked of paint thinner (they’re undergoing renovations, we’re told). 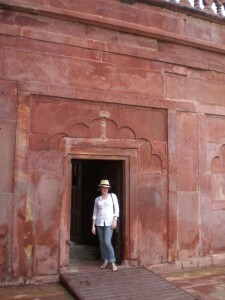 With another old-fashioned lock and key, we enter and find a room that was surprisingly better than the hotel in Delhi. No bugs or lizards in sight, and there was a full toilet as well – comforts I’ll no longer take for granted. We drop off our backpacks and climb up one more flight to the rooftop restaurant. There, in the distance but unobstructed, is the magnificent Taj Mahal. Commissioned in 1631 by the Mughal emperor Shah Jahan for his beloved wife Mumtaz Mahal, this “crown palace” was built by 20,000 artisans and laborers over 20 years. It was a tribute of love and devotion to the emperor’s wife, who died giving birth to the couple’s 14th child. On her deathbed, he promised her a glorious resting place for the two of them, and within these walls, these two soulmates remain. 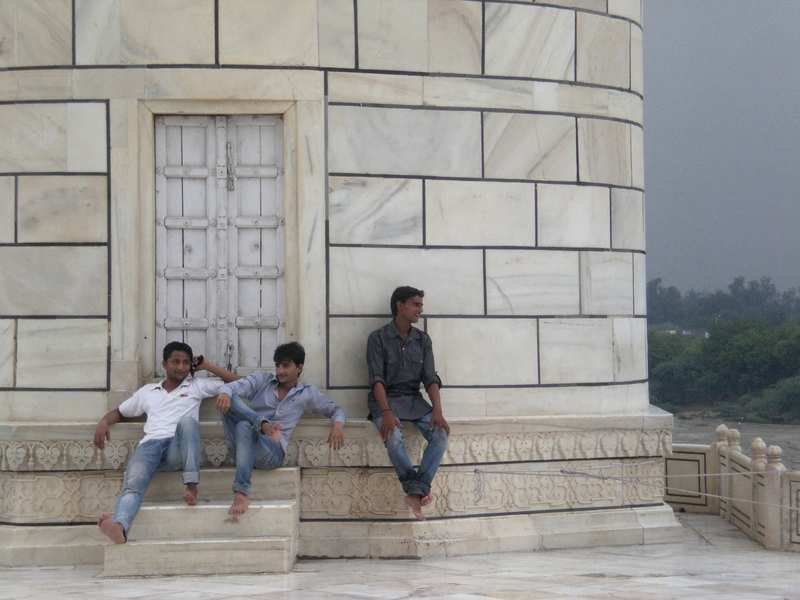 The Players – some locals experience the calm before the storm at the Taj Mahal. A picture of one of the outer chess pieces, as I affectionately refer to them. Though it’s only mid-afternoon, we will not see it up close today. Three days prior as I was waiting to board my plane, I chatted with a woman who was heading to Agra to meet her fiancé, a native to India and a guide for the Taj Mahal. I told her of our plans to see it, and she shared with me a little known fact that I’ve never seen in any guidebook. 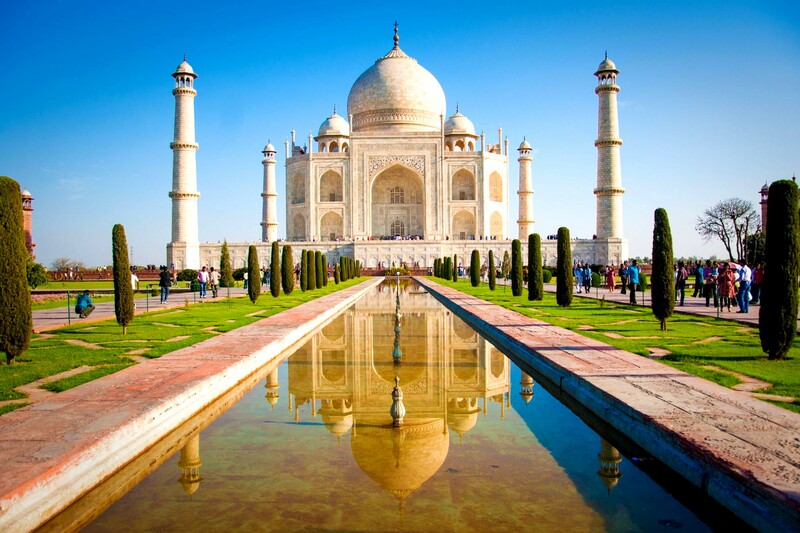 Each year, 3 million people visit the Taj Mahal to see the royal couple’s resting place, circling the tombs centered up the steps inside a grand marble structure. But the tombs they see – the two human-sized blocks of marble resting side by side inside the mausoleum, ceremoniously adorned with flowers – are fake. These cenotaphs keep the masses away from the real thing, and possibly served as a decoy to looters in the past. The real tombs are safely and quietly housed underground, protected from the elements and off limits to the general public. 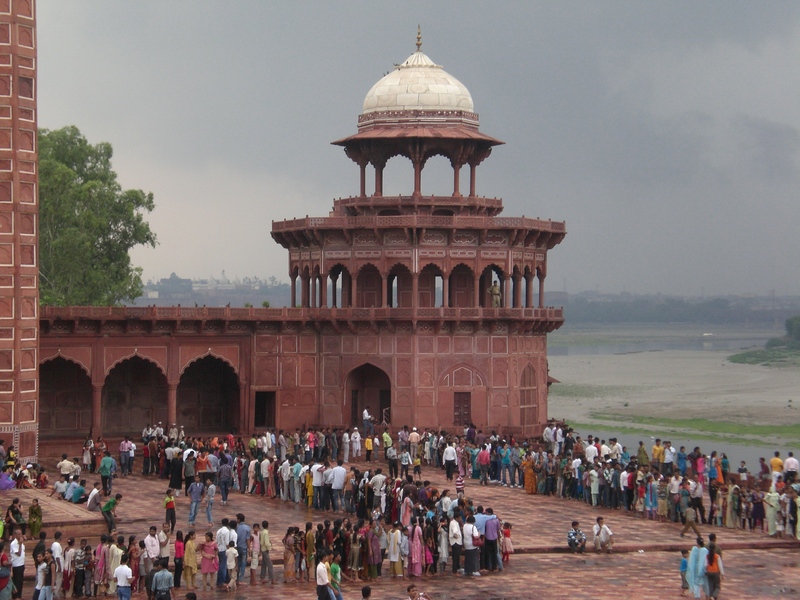 But for three precious days each year, the Urs festival takes place commemorating the death anniversary of Shah Jahan, and the lasting love he carried for his favorite wife. And during these three days, visitors are granted access to the real tombs. Tickets, approximately $15 for foreigners – a small fortune by Indian standards – are also free. It’s a massive celebration, and people pay tribute with offerings and prayer. Varying year to year, the festival falls on the first 3 days of the seven-month Islamic Rajab calendar, so be sure to plan accordingly if you want to see the real thing. So, it being one day before the festival, we would instead get lost in the town and see what might find us. I am still looking to buy presents for the people I love, though I have no idea what to get. Steps outside of our hotel is a jewelry shop. Yes! I had wanted a new ring to wear every day, so I could definitely start there. As Chloë buys cigarettes next door, I peek inside the dark and small shop, cupping my hands around my eyes at the window. The shop is up a few steps, with one main glass counter and jewelry encased along the walls. There are three small stools in a row with a man laying across them; the bottom of his feet are eye level with me, and he is fast asleep. “No, I think they’re closed.” Just as I turn away from the shop, I hear a friendly voice eagerly shout, “Yes, madam! Come, come!” I look around me, and up comes a very gentle and polite man wearing an ivory white sari with sandals. He is Arif the shopkeeper, and he scampers up the steps to welcome me inside as he boots his brother from his napping place on the stools. His brother, another jovial fellow, gladly obliges. The lights come on, we sit down, and Arif promptly offers Chloë and me cups of chai tea as we look through cases and bags of jewelry. Almost instantly, I find what I’ve been looking for: a beautiful silver and garnet ring, with two crescent moons holding the polished but uncut stone. Native to India and Nepal, the garnet is also my boyfriend’s birthstone. A lovely reminder of him. I ask the price; he examines it, weighs it, and measures it. He punches numbers into a calculator, and presents the screen to me. By this point, I feel very VIP and wealthy, going along with the celebrity feeling I’d had a day earlier. I’m really liking India. What I can best describe as the girl version and the boy version! “Yes!” Excellent! And he shows me a very sparkly, very feminine set of cut and faceted garnet cuff links. Umm, no. I turn to Chloë. “Kind of girly, don’t you think?” Chloë concurs, “Yeah these aren’t very masculine.” The shopkeeper assures me that they are, in fact, very masculine. I show him the sparkling garnet cuff links. “Do you have any that are uncut? That don’t sparkle?” I ask. “Yes!” he exclaims. I am thrilled. He pulls from a bag…peridot green cuff links. >smack< “No…that are garnet.” “Ah! No, madam.” He shows me the sparkly ones again. Something is being lost in translation. He gestures at the bracelet; he’ll take two stones from it and make me a set of cufflinks. “Really?! But it’ll ruin your bracelet.” “No, madam. Not a problem.” I’m delighted. “Yes! Let’s do it. Wait! We leave tomorrow night. Could they be ready by then?” He ponders for a moment. “Yes, tomorrow night. Prayer at 5:30, so after 6:00.” He gives me the magic number on the calculator and I pay the deposit. He also measures my finger to size my ring for pickup later today. As we get up to leave, he thanks us and bows his head, which I react in thanks by bowing my head, and I step back out into the heat of day with Chloë. The air is thick and moist. I realize one of the benefits of visiting during monsoon season is that the rain not only smells nice, but it keeps the dust down – something so prevalent given the more-common-than-not unpaved roads. We enjoy a leisurely afternoon picking up some basics –shampoo, toilet paper, and bottled water; it is now that I begin to notice a very peculiar pattern with the peddlers, the children especially – when you buy something, anything – a bottle of water, for example – suddenly, everyone comes up to you and tries to sell more. Like if you need one bottle of water, surely you need seven. I pick up my new ring and chat briefly with Arif, and then meet Chloë for another rooftop meal. We watch as the Taj Mahal fades in the dusk, and we tuck in early to get a good night’s sleep. We do not get a good night’s sleep. Just as I start to nod off, a lone dog feels compelled to howl and bark until all of his dog friends join him. I hear more dogs now than I had seen on the entire trip. Not to be outdone, each dog responds more loudly than the last. This goes on for an hour. I think they all must be losing their little dog voices because finally I hear silence. This is then broken by the need to get the last dog “word” in. The barking starts all over again. It’s relentless. Finally in sheer exhaustion, I sleep. In the morning at dawn, we rise to see the wondrous tomb in the distance. Up on the roof, we join other backpackers who stand quietly observing. It’s peaceful and for the first time, the air is cool. The impending storm has smothered the heat, and a breeze tickles my neck. The smell of the rain washes over me, reminding me of other places. Funny how a place so far removed from the familiar suddenly reminds me of Scotland. The breakfast we order at a little café in town consists of two pieces of toast, a banana, and chai tea for 30¢. Our hotel here in Agra, also about $10 per night, lets me safely say that once you actually get to India, the cost of your trip can drop dramatically. As we leave, we get caught in a torrential monsoon downpour, driving us back to the hotel. 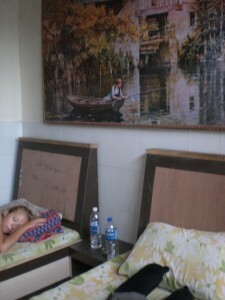 There, Chloë naps as I write, and we wait for 2:00pm when the festival begins, and the doors to gates of the Taj Mahal open. We get lost in a winding labyrinth of dirt paths leading to homes, in circles, or simply dead ends. There are no street signs here; really, there are no streets. Finally by chance we end up on track. This is confirmed by the stalls of wall-to-wall tchotchkes depicting the Taj Mahal becoming more and more concentrated as we get closer. Outside of the gate, there is already a line for the security checks; we wait patiently even as several Indian girls blatantly cut in front of us. It proves futile to point out the rudeness, so we simply stand uncomfortably close behind to prevent this from continuing. Once passed through the entrance, I am transported into a storybook of grandeur. A palatial expanse of gardens and trees stand protected within the red walls surrounding the Taj Mahal. A long and narrow pool, an unexpected oasis, entices us toward the tomb. I am in awe. With every step closer, I feel myself getting smaller and smaller. With its apex at 24 stories high, pictures cannot do justice to the magnitude with which this structure exists. Prior to climbing the steps, we are informed that our shoes are to be removed: out of respect for this sacred space, no one is allowed inside the Taj with shoes. I hesitate to leave the only pair of shoes I brought. Keeping with the last several days, we are still photographed relentlessly, and I fear our shoes will disappear as souvenirs of the only two blonde girls in Agra. The line outside the Taj Mahal to see the real underground tomb – lucky for us, we were just leaving! We also just missed a downpour that fell shortly thereafter. Barefoot but strangely comfortable, I ascend the steps and feel like for a moment that I am a princess whose palace is this beautiful structure before me. It’s a very funny thing to feel that way since I’m no longer five, but after all, I certainly don’t walk around barefoot much outside my home. Nor does my little apartment look like this. The marble beneath me is cool, never once yielding to the returning summer heat. It’s so very quiet despite the growing crowds. I feel I am in a place that is blessed, and my mind and soul are completely calm. I am overcome with a sense of love and peace in a way I never expected. Just being here, I see why it’s considered one of the new seven wonders of the world. We make our way to the dark stairway that leads to the real tombs of Shan Jahan and Mumtaz Mahal, down several steps, into a cool, dark chamber. Lit by candlelight, the chamber is damp and musky, and incense burns nearby. Offerings in the form of flowers, charms, and pictures line the sarcophagi, and people quietly and slowly pay their respects. We’re given a few minutes, never allowed pictures, and then we’re ushered out to continue the procession of visitors. What was a manageable wait when we arrived had become a snaking line around the perimeter four people deep – I was grateful for what I just saw, and that we arrived when we did. 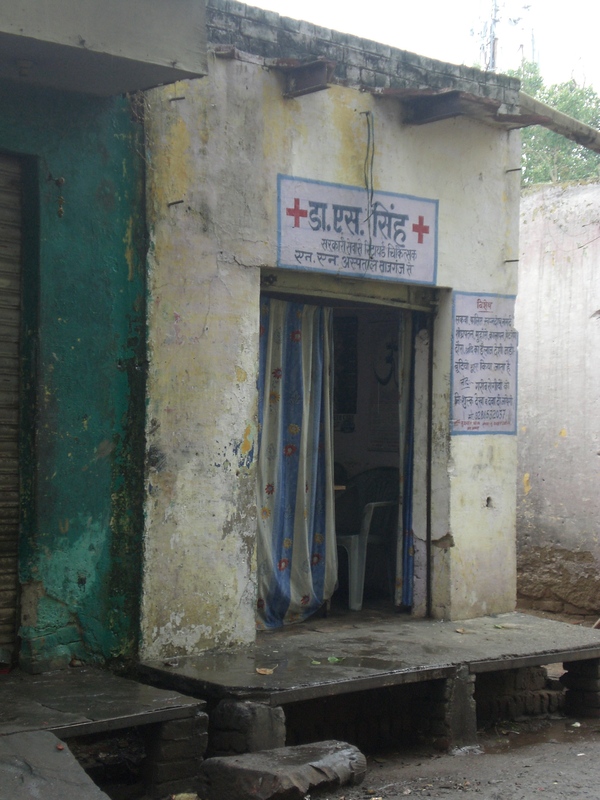 Equal to my fear of losing my shoes and stepping on broken glass barefoot was my fear of visiting the local hospital. What seems like a challenge on The Amazing Race, except not as fun, we search amongst thousands of pairs of shoes for ours, not finding them in the place where we left them. In a panic for 20 minutes and thinking of all that could possibly go wrong with walking barefoot in the rest of Agra – trash, broken glass, and contaminated water are hard to avoid on the ground here – they finally surface and we are on our way. As I leave this symbol of such great love, I head to the jewelry shop to pick up the gift for the man I love. 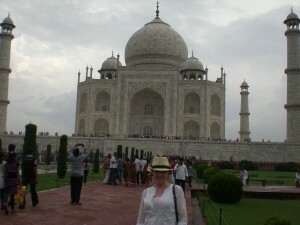 I meet Arif at 6:00pm, and tell him all about our afternoon at the Taj Mahal. Returning from the back room, he presents to me a little red velvet bag. Untying the string cinching it, he shakes into his palm two little balls of cotton. He unwinds the cotton and reveals two elegant but masculine garnet and silver cufflinks. They turned out even better than I could have imagined, and Arif smiles at my pure delight. They are handsome and perfect; reflective of the man they’re for. At that moment, I couldn’t wait to get home. I still can’t believe I am here! 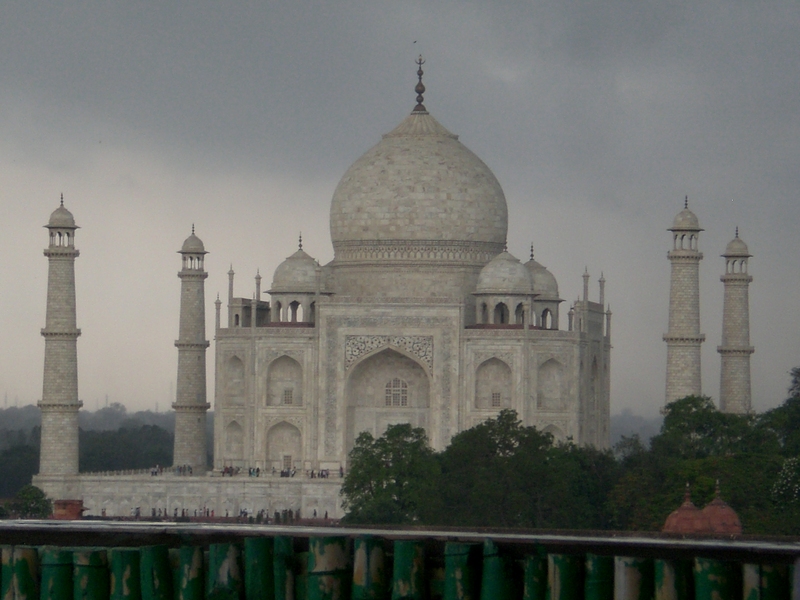 The Taj Mahal has taken on a lot of gray amidst monsoon season. Very majestic! But there is much more to see. I wind down the day with the cufflinks in my hand, and the Taj Mahal behind me – and feel a tiny parallel of love in both.